Main goal of the project is the development and optimization of a resource efficient and decarbonized transportation system, supported by the use of advanced and highly integrated wide band gap (WBG) technologies in electronic power circuits of electrified vehicles and charging infrastructures. Transportation system in Europe is one of the main contributors to the total Greenhouse gas emissions (GHG) and global climate warming. Only the massive introduction of affordable electrified vehicles is the way to meet the very ambitious CO2 targets, which of course must be accompanied by the introduction of renewable energy sources. 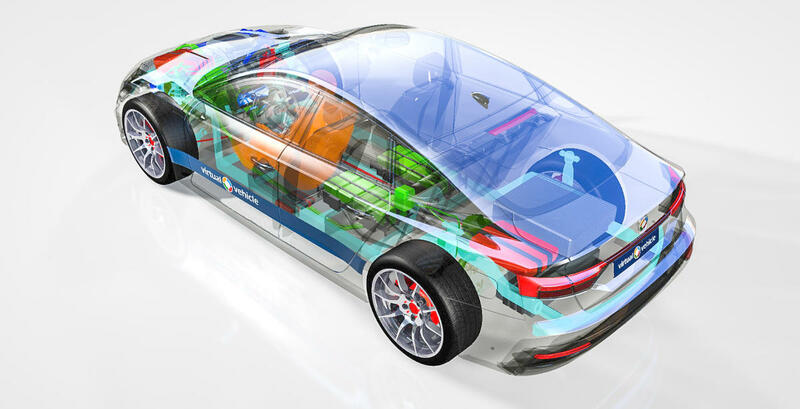 The project HiPERFORM directly addresses topics connected with the reduction of GHG with the introduction of WBG, high efficient power electronics in the drivetrain of electric vehicles. All types of electrified vehicles need efficient power electronics to convert electrical energy from different voltage levels or from AC to DC and vice-versa. Intelligent control modules and charging units need to balance and control energy from various sources, aiming at the optimum with minimal energy resources and losses. Recent innovations in highly efficient power electronics with WBG materials like SiC (silicon carbide) and GaN (gallium nitride) will help to reduce more than 50% in energy losses, size and weight of inverters compared with conventional inverters based on Si technology. Direct savings in worldwide energy consumption may reach 12,83TWh per year, if only 2% of vehicles are using these new technologies. Activities within the project are divided into six work packages (WP). The requirements are derived in WP1 on the basis of the use cases and are directly fed into the technical work packages, which have a sequential flow of activities. However, it is also clear that activities in technical WPs will also happen in parallel based on existing results taken out of other research projects, in order to avoid any delays due to too strict dependencies from each other. The demonstration and evaluation of the concepts and approaches will take place in WP1 again to close the loop, which might have more than one iteration. WP1 will develop clear specifications for use cases with the involvement of all relevant stakeholders for the specific one. A second stage will setup clear requirements for the use cases and get a common understanding about the needs to establish the use case demonstrators and how the work will contribute to the fulfillment of the project objectives. The performance and finally the fulfillment of the project targets and requirements will be evaluated via criteria and performance indicators. Last but not least in WP1 use case demonstrators will be built up in a relevant environment that are able to show, demonstrate, and evaluate the potential for fulfilling the requirements and project objectives. Applications which are demanding higher switching frequencies have a strong demand for switches that cannot be realized with silicon. For this reason, in HiPERFORM Project, it is planned to use WBG switches that show up excellent switching performance and higher power density. Current WBG switches are suffering from missing field reliability experience and price performance issues. Accordingly, WP2 addresses new approaches to reduce defect densities and improve the cost performance of expensive processes, like substrates and epitaxial layers for buffer and device. Also research work on the WBG switches itself will be performed including innovative tests, enabling much higher reliability by appropriate screening. Another goal of WP2 is to investigate advanced GaN substrates and buffer layers and increase their technology readiness for applications. Reliability is a key requirement for automotive applications and defects in the hetero-epitaxially grown buffers contribute to eventual failure of the switches. In HiPERFORM buffers and switches will be developed on new substrates with a specific focus on evaluating and reducing buffer-induced failures of the switches. WP3 deals with the design and architecture optimization of drivetrain systems (inverter, charger, converters) and its electronic systems by reducing volume and weight towards energy efficiency systems with co-design optimization. Multi-physics simulation is considered as basic aspects for better understanding the dynamic behaviour of the next generation WBG solutions and its stability in the considered electronic systems. WP3 will also research robust control algorithms (switching) and strategies to comply with the fast dynamics of the next generation WBG devices operating at high-switching frequencies. An assessment of next generation SiC and GaN technology for next generation systems in terms of stability, reliability, compact packaging, is another important objective together with TCO Optimization considering the lifetime and reliability factors by reduction of costs. 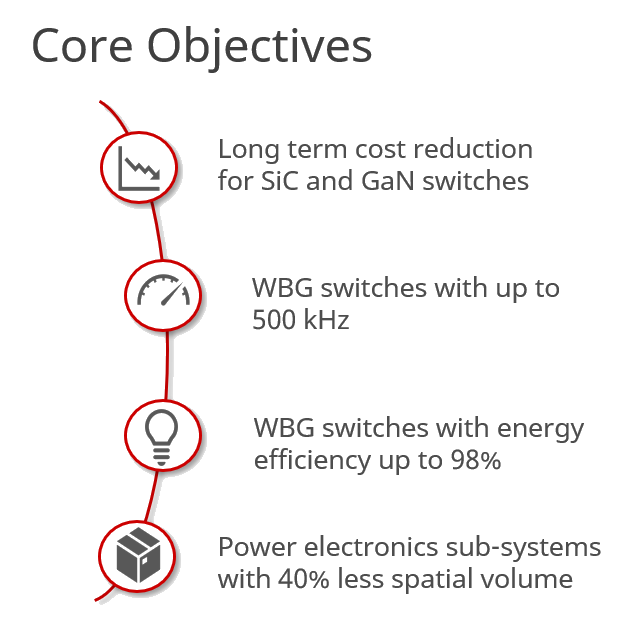 In WP4, the developed power electronic switches with the next generation SiC and GaN technologies will be further optimized in terms of packaging, sizing, and thermal management before the optimization and implementation towards the full system in WP5. Hereby, advanced 3D simulation tools will be applied to optimize the packaging and thermal management with respect to the defined cost, volume, and weight targets. The latter one will be optimized based on novel thermal management concepts such as phase change materials (PCM) or hybrid concepts (PCM infiltrated into Al-foam) or gap fillers. The main objective of this work package is the design and approval of advanced inverter concepts, charging device concepts, and test system prototypes that make use of the advanced SiC and/or GaN technologies, module topologies, and low-level controller concepts in the other technical work packages (WP2, WP3, WP4). All concepts will be designed and built up based on the requirements of pre-defined use cases in WP1. The target for each use-case includes loss of energy reductions, improvements in used space and costs, optimal usage of additional passive components, cooling circuits, and housings. The final objective of this work package is the design and development of concepts for inverters, charging solutions, and test systems (including the corresponding control strategies) for the electrical powertrain in electrified vehicles. This work package summarizes all coordination and management activities. The aim is to provide efficient project structures to manage resources and results according to the project plan and ensure exploitation by continuously mitigating the risk, which might come up. Other relevant activities will be dissemination and exploitation. Communication is also considered as part of the Project Management activities, promoting the project and the results to the public and media audiences. One of the goals is to demonstrate how EU funding contributes to tackling social challenges and to promoting manufacturing and research in Europe.